NASA celebrated a key triumph on Tuesday as its $1.1 billion Juno spacecraft successfully slipped into orbit around Jupiter on a mission to probe the origin of the solar system. NASA‘s Jet Propulsion Laboratory in Pasadena, California erupted in cheers as the solar observatory entered its aimed-for orbit around the biggest planet in our cosmic neighborhood at 11:53 p.m.
“We are there. We are in orbit. We conquered Jupiter,” said Scott Bolton, NASA’s principal investigator from the Southwest Research Institute in San Antonio, Texas. Juno launched five years ago from Cape Canaveral, Florida and has traveled 2.7 billion kilometers since then. 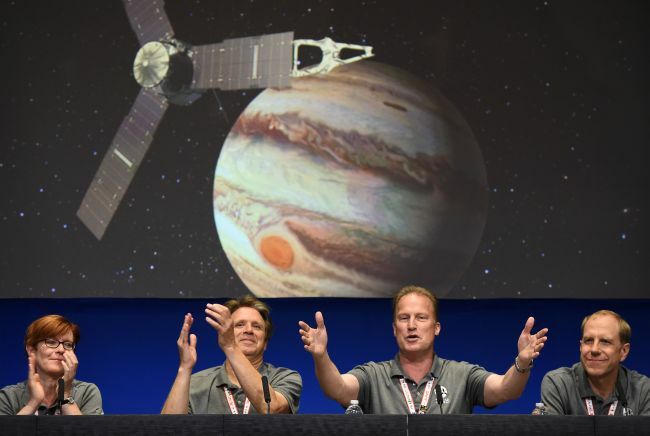 (From left) Diane Brown, NASA Juno program executive, Scott Bolton, Juno principal investigator, Juno Project manager Rick Nybakken and Guy Beutelschies, Lockheed Martin director of space exploration, celebrate at a press conference after the Juno spacecraft was successfully placed into Jupiter's orbit, at the Jet Propulsion Laboratory in Pasadena, California on July 4, 2016. Its arrival marks the start of a 20-month mission, during which scientists hope to find out more about how much water Jupiter holds and the makeup of its core in order to figure out how the gas giant -- and other planets including Earth -- formed billions of years ago. “This amazing universe that we see, how does that work and how did it begin?” asked NASA project scientist Steve Levin. The spacecraft is equipped with nine science instruments, including a camera, which prior to orbit captured a video of Jupiter and its moons gliding around it at different speeds. “In all of history we've never really been able to see the motion of any heavenly body against another,” said Bolton, after showing the video during a post-orbit press conference for the first time. “This is the king of our solar system and its disciples going around it,” he said. All non-essential equipment was turned off for the approach, but the first post-orbit pictures from the spacecraft’s on-board camera should arrive in a few days, NASA said. Juno‘s inaugural lap around the solar system’s most massive planet -- the fifth from the sun -- will last 53 days. Subsequent orbits will be shorter, about two weeks each. The first mission designed to see beneath Jupiter‘s clouds, Juno is named after the Roman goddess who was the wife of Jupiter, the god of the sky in ancient mythology. The spacecraft orbits Jupiter from pole to pole, sampling its charged particles and magnetic fields for the first time and revealing more about the auroras in ultraviolet light that can be seen around the planet’s polar regions. Juno should circle the planet 37 times before finally making a death plunge in 2018, to prevent the spacecraft from causing damage to any of Jupiter‘s icy moons, which NASA hopes to explore one day for signs of life. Although Juno is not the first spacecraft to orbit Jupiter, NASA says its path will bring it closer than its predecessor, Galileo, which launched in 1989. That spacecraft found evidence of subsurface saltwater on Jupiter’s moons Europa, Ganymede and Callisto before making a final plunge into Jupiter in 2003. Juno‘s orbital track is closer than Galileo’s -- this time within 5,000 kilometers above the cloud tops. A leading concern has been radiation levels -- as high as 100 million X-rays in the course of a year, she explained. Those high-energy electrons, moving at the speed of light, “will go right through a spacecraft and strip the atoms apart inside your electronics and fry your brain if you don‘t do anything about it,” she said.